1st Lt. David Bernstein may have been killed in action two years ago, but the Army and his fellow Soldiers never forgot about him or his actions the day of his passing. Capt. John McDougall, 1st Battalion, 508th Infantry (Airborne), served with Bernstein, who was the executive officer of Charlie Company in Iraq and related the story of what happened. On the way to the suspected site, Charlie Company was ambushed by insurgents using small arms fire, which resulted in Bernstein’s vehicle flipping over on a berm and throwing the driver out and pinning him underneath. Bernstein’s gunner was also shot in the back. Two years after that day, Bernstein’s family received a Silver Star award on his behalf in a small ceremony held at his parent’s home in Vonore, Tennessee. McDougall joined Lt. Col. Harry Tunnell, Bernstein’s battalion commander in Iraq, for the ceremony and presentation of the award. The community showed their support for the Bernstein family by turning out in force for the event, including retired officers and even the local chapter of the American Legion to perform as the Color Guard for the ceremony. McDougall said presenting the Silver Star two years after Bernstein’s death made it possible to celebrate the actions of their son, instead of it being presented during the funeral while the grieving process was just beginning. “The one thing I told them was ‘Sir, ma’am, there are dozens of [Soldiers] who would love to be here if they could,’” said McDougall. “But they’re all in Afghanistan, and I was the one who had the privilege to do this. I know those men would do anything to be able to be here today. * The Outlook is a community newspaper for Caserma Ederle and Camp Darby. The Outlook is published every Tuesday by USAG Vicenza Public Affairs Office. 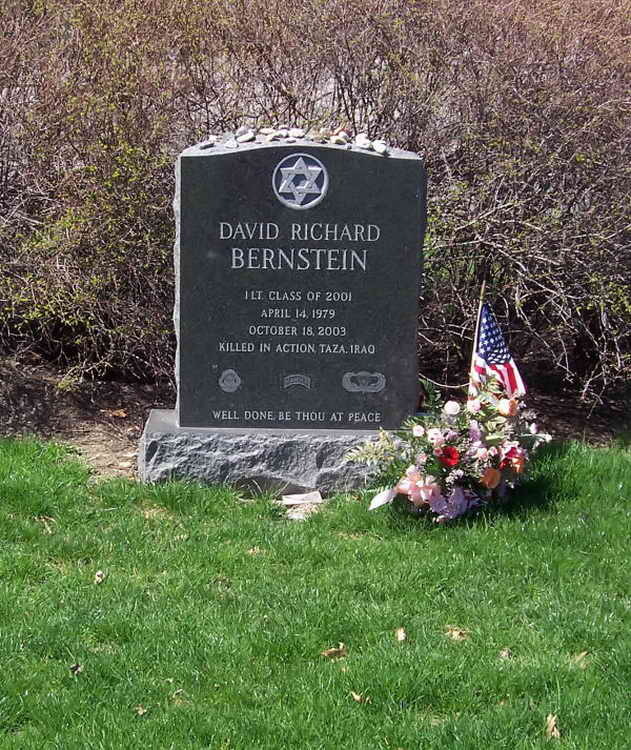 Grave marker for 1st Lieutenant David R. Bernstein in the United States Military Academy Cemetery, West Point, New York. The above article appeared in the December 2005 issue of "The Outlook" The Outlook is a community newspaper for Caserma Ederle and Camp Darby. The Outlook is published every Tuesday by USAG Vicenza Public Affairs Office. David Bernstein, 24, formerly of Phoenixville, Pa., a first lieutenant with the Army's 173rd Airborne Infantry Brigade, was killed on October, 16, 2003, in Iraq, when enemy forces ambushed his patrol with rocket-propelled grenades and small-arms fire. According to the local Phoenixville paper, the 173rd is famous for its quick reactions, most often carried out by parachuting into war zones. Bernstein was dropped into northern Iraq at the beginning of the war and had remained there since, according to his father, Richard Bernstein. His father told the paper, "He was an exceptional man and a wonderful person and he will be missed terribly. He felt very indebted to this country for what it has done for him, and for everyone. He wanted to serve his country, and he did." David Bernstein was the 1997 valedictorian of his high school. He graduated fifth in his class from the U.S. Military Academy at West Point four years later. His funeral was held at the Jewish chapel at West Point. Survivors include his parents, a brother, and sister.